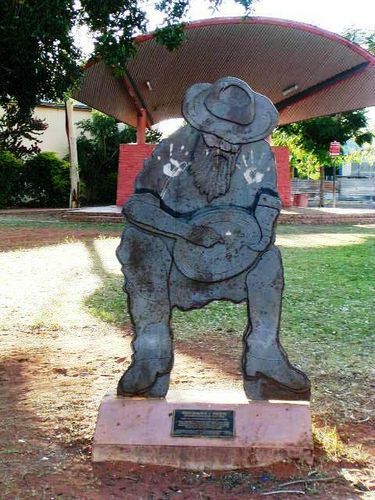 A metal etching of a miner panning for gold recognises that Tennant Creek was the site for the last gold rush in Australia during the 1930s. At that time it was the third-largest gold producer in Australia. Gold was discovered in the ranges three miles north of the current town area in 1926 by J Smith Roberts. In 1927 Charles Windley, a telegraph operator, found gold on what would become Tennant Creek's first mine, The Great Northern. Australia's last great Gold Rush did not commence, however, until after Frank Juppurla, a local Indigenous man, took gold to telegraph operator Woody Woodruffe in December 1932. The population quickly grew to about 600, 60 of whom were women and children. “Battery Hill” which overlooks the town of Tennant Creek is the site of one of the last two operating ten-head stamp batteries, a Government owned ore crushing machine.